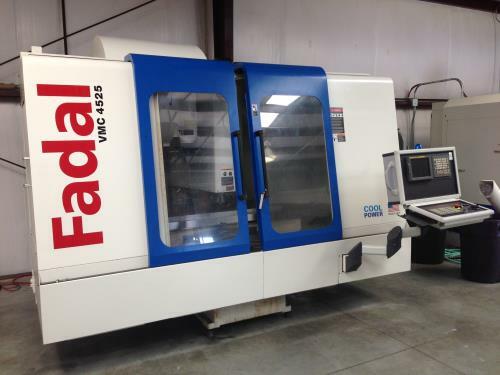 Machinery Resources International - For Sale - 2015 FANUC ROBODRILL D21MiA5 InventoryDetail - Machinery Resources International Inc.
TABLE TOP TO SPINDLE END: 5.9"-18.89"
SPINDLE CENTER TO COLUMN GUIDEWAY: 14.96"
TABLE SIZE: 25.6" X 15.74"
TABLE LOAD CAPACITY: 660 LBS. DUAL CONTACT: TAPER / FACE "BIG PLUS"
CONTINUOUS MANUAL FEEDRATE: 0 - 157"
AXIS THRUST (Z): 702 LBS. AXIS THRUST (X, Y): 356 LBS. MACHINE SIZE: L: 62" x W: 79.9" x H: 88.1"
MACHINE SIZE WITH COOLANT TANK: L: 62" x W: 94.9"
FLOOR AREA (INCLUDING CHIP CONVEYOR): L: 98" x W: 111"
MACHINE TOTAL WEIGHT: 4,400 LBS.